(Bloomberg Businessweek) -- After an out-of-control Tesla Model S plowed into a stand of palm trees on a highway median outside Fort Lauderdale last month, police rushed to put out the ensuing blaze using a department-issued fire extinguisher. It was a wasted effort. The car kept on burning after the crash, which killed the driver. While one witness said the car “flew” past him, police said it was traveling at the posted speed limit of 50 miles per hour. With more than 760,000 electric and plug-in vehicles on the road in the U.S., according to the International Energy Agency, emergency responders with little past exposure to these cars are becoming more likely to encounter one at a crash scene. 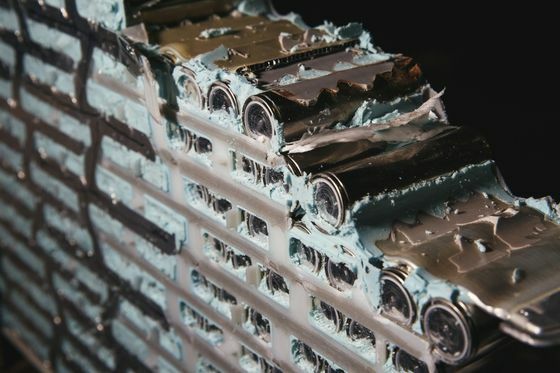 The U.S. National Transportation Safety Board is already investigating multiple incidents involving EV battery fires and problems encountered by emergency personnel. The agency plans to issue a set of recommendations based on four reference cases by late summer or early fall. “That will be the first major report addressing the issue,” said NTSB spokesman Chris O’Neil. Electric vehicles are no more prone to accidents or fires than gasoline-powered cars—and might be less so, according to a 2017 report by the National Highway Traffic Safety Administration. That report also notes battery technology is still evolving, without any consensus on safe system design. Battery-powered cars remain a tiny minority in the U.S., with sales of EVs accounting for just 1.2 percent of total new vehicles delivered in the U.S. last year, according to data from Edmunds. But the expectation that EV sales will rise sharply within the next five years makes it critical to educate first responders and develop new standards that make identification and troubleshooting easier for police, firefighters, and tow truck operators. So far about 250,000 of the roughly 1.1 million firefighting personnel in the U.S. have undergone some form of EV training, according to estimates from the National Fire Protection Association. “First responders have 100 years of experience dealing with internal combustion engines, but it’s a very different situation when it comes to EVs ,” said Andrew Klock, program manager for emerging technology at NFPA, a nonprofit based in Quincy, Mass. “Every time an EV catches fire, we get a lot of calls” from emergency management coordinators, he said. The NFPA began conducting training and creating reference manuals about a decade ago just as the Chevy Bolt and Nissan Leaf were about to debut. It has worked closely since then with General Motors Co. and other automakers to educate first responders about what wires to avoid, where critical components are located under the hood, and how to control battery fires. The NFPA provides check sheets for most makes and models. Higher voltages are part of a trend designed to maximize efficiency and boost horsepower. “We think you could see a world of 1,200 volts” for vehicles in a few years, said Mary Gustanski, chief technology officer at Delphi Technologies Plc, a major automotive powertrain supplier. But she said advanced componentry could eventually do away with most high-voltage cabling. The orange color coding was one early step taken by automakers to aid first responders and auto repair technicians. Other efforts include standardizing instructional materials and advocating three-sided badging on vehicles to help identify EVs. That’s being shepherded by a Society of Automotive Engineering task force, which includes representatives from 11 automakers as well as auto suppliers and government officials. The SAE is expected to update those guidelines later this year with more recommendations, such as using an “e” (for electric) as a prefix or suffix on nameplates of newer EVs. Officials say future revisions may include calls for a kill switch to cut off power under the hoods of electric vehicles. Countries outside the U.S. also are grappling with the issue of familiarizing emergency response crews with electric cars. In 2016 firefighters in a small town in Norway allowed a Tesla to burn to the ground at a charging station, leaving only the charred remains of the frame and wheels, because they mistakenly feared using water could lead to an electric shock. Later that year, firefighters in the Netherlands delayed extracting the body of a deceased Tesla driver involved in a crash due to fear of electrocution if they cut a wire in the car’s frame. 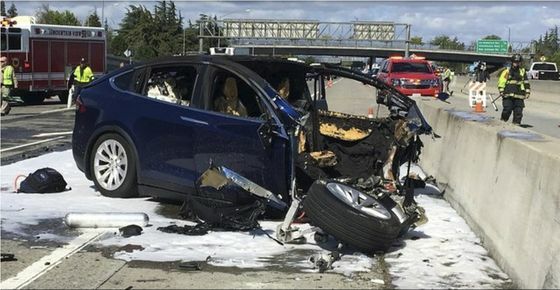 In the aftermath of that incident, Dutch authorities turned to one of the leading authorities on Tesla vehicles involved in accidents: the fire department in Fremont, Calif., where the automaker’s factory is located. The department has ample experience responding to EV-related incidents, including a fire at Tesla’s plant earlier this year requiring the full submersion of battery packs in water tanks, said Cory Wilson, a captain at the Fremont Fire Department. “We’ve had several incidents there,” he said. Tesla has donated hundreds of vehicles to the local fire department for use in deconstructive demonstrations of the Jaws of Life and other rescue tools. “We’ve cut up 400 to 500 Teslas over the past five years,” said Wilson. The Fremont Fire Department now has about 50 Teslas ready for the next of its regular two-day classes attended by emergency personnel from around the country. Visiting crews are taught how to safely cut through and demobilize the electric vehicles. Wilson said he accepted an invitation on behalf of the department to teach a special session in The Hague, Netherlands, for Dutch and German first responders in 2017.